This leather loveseat is an elegant piece to add to your living room or den. It features plush cushioning, both from the pillow top seats and the double layered back cushions, creating a lovely sink-in, relaxing feel. 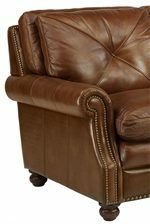 Back cushions feature a center tufted design, and rolled arms are adorned in nailhead trim, which continues along the back frame and front panel. Turned wooden legs support this loveseat, which can be upholstered in a variety of fine leathers to match the style and decor of your home. The Latitudes-Suffolk Leather Stationary Loveseat with Nailhead Trim by Flexsteel at Jordan's Home Furnishings in the New Minas, Halifax, and Canning, Nova Scotia area. Product availability may vary. Contact us for the most current availability on this product. Fabric Options Choose from more than 1,000 fabrics to customize the look of your furniture to your own personal style. Seat Back Three over three cushion design; double cushioned backs; back frame is trimmed with nailhead trim; cushions feature tufted X-design. Seat Pillow top cushioned, box seat cushions. Frame Construction Precision engineering of moisture resistant cross-grain laminated hardwoods let us create frames so strong you can count on them for a lifetime – we guarantee it. The Suffolk Collection is an elegant, traditional collection that will bring sophisticated comfort to your home. The collection features plush, pillow top seating with double cushioned backs, providing you with that sink-in, relaxing feel. Nailhead trim adorns rolled arms, back frame and front panels. Choose from a variety of fine leathers to customize the look of this collection to match the style of your home. The Latitudes-Suffolk collection is a great option if you are looking for Traditional furniture in the New Minas, Halifax, and Canning, Nova Scotia area. Browse other items in the Latitudes-Suffolk collection from Jordan's Home Furnishings in the New Minas, Halifax, and Canning, Nova Scotia area.